I promise that I'll give an actual writing update soon, but for now... this came out on Saturday. I like it when my students do all of the work and I can sweep in and take the credit. That's kinda what happened with this. And by "kinda" I mean "did." Over the past year, I have had the distinct pleasure of getting to know Jordan Gorsuch. He actually took my aforementioned apocalypse course. A literature major, it should come as no surprise that Jordan and I were both taken by Colson Whitehead's masterful zombie novel, Zone One. This is not your ordinary zombie novel. Whitehead uses the genre to probe deeply into the ways that humans categorize themselves and others, making tactical decisions about who is--and is not--fully human. He is also wickedly satirical, drawing focus on consumerism, popular culture, government, and capitalism. But the writing is Faulknerian. Beautiful, but challenging. So the rest of the class hated it. This spring, Jordan needed an internship. And I needed a helper. A few years ago, I noticed these bizarre murals at our courthouse. They looked somewhat like other WPA paintings that one might see in post offices and other public places. 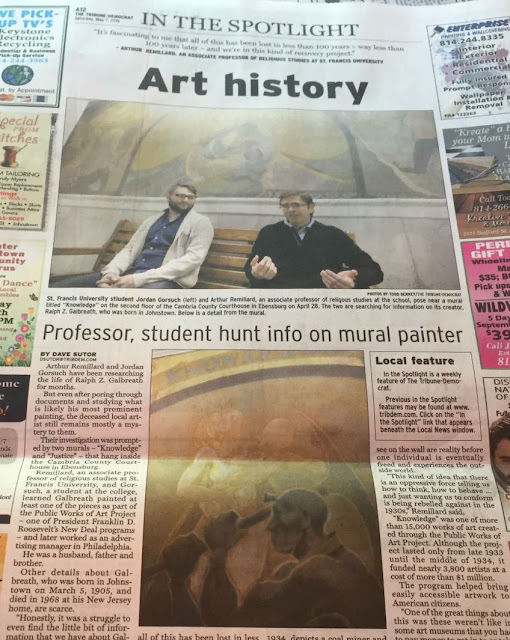 Indeed, during a conversation with someone from our local historical society, I asked about the murals. She knew nothing. Not the name of the artist. Not when it was done. Nothing. She only speculated that they were WPA paintings. So I put Jordan on the task and he dove in. While not having any background in archival research, he figured it out as he went. Commissioners records, old microfilms, newspapers... He sorted through it all. What we (and by "we" I mean "he" here and throughout what remains) discovered is that there is plenty left to discover. The artist, Ralph Z. Galbreath, didn't leave us much of a paper trail. We have yet to find anything from him talking about the mural, giving us any background on what he intended. But we did figure out that this was not a WPA painting. It was actually the product of the Public Works of Art Project. For a few months in early 1934, Roosevelt et al., funneled a bunch of funds toward the arts, directing recipients to capture "the American scene." The result was over 15,000 original works of art produced in four months. By April of 1934, the PWAP hosted an exhibit in Washington D.C. The public response was overwhelmingly positive, with congressmen lining up to take paintings for their offices. Of course, the White House also took a share of paintings too. The WPA would soon follow and it seems reasonable to conclude that the PWAP laid the groundwork for this much larger and longer-lasting program. Returning to Galbreath for a moment. We discovered among other things that murals are VERY rare in the PWAP world. At our courthouse, there are actually two murals, one called "Knowledge" and the other "Justice." All of the sources that we have now are about "Knowledge." "Justice," we suspect, was done later, probably with WPA money. Galbreath was likely the artist, since the style is so similar. But we really don't know. So there are plenty of stories left to tell about these murals. Unfortunately, Jordan is moving on to graduate school. I guess I'll have to start doing my own work on this one. The horror.